In orbital mechanics, a Lissajous orbit, pronounced: , named after Jules Antoine Lissajous, is a quasi-periodic orbital trajectory that an object can follow around a Lagrangian point of a three-body system without requiring any propulsion. Lyapunov orbits around a libration point are curved paths that lie entirely in the plane of the two primary bodies. In contrast, Lissajous orbits include components in this plane and perpendicular to it, and follow a Lissajous curve. Halo orbits also include components perpendicular to the plane, but they are periodic, while Lissajous orbits are not. In practice, any orbit around Lagrangian points L1, L2, or L3 is dynamically unstable, meaning small departures from equilibrium grow exponentially over time. As a result, spacecraft in libration point orbits must use their propulsion systems to perform orbital station-keeping. In the absence of other influences, orbits about Lagrangian points L4 and L5 are dynamically stable so long as the ratio of the masses of the two main objects is greater than about 25, meaning the natural dynamics (without the use of a spacecraft's propulsion system) keep the spacecraft in the vicinity of the Lagrangian point even when slightly perturbed from equilibrium. These orbits can however be destabilized by other heavy nearby objects. It has been found for example that the L4 and L5 points in the Earth–Moon system would be stable for billions of years, even with perturbations from the sun, but because of smaller perturbations by the planets, orbits around these points can only last a few million years. Several missions have used Lissajous trajectories: ACE at Sun–Earth L1 and WMAP at Sun–Earth L2 and also the Genesis mission collecting solar particles at L1. On 14 May 2009, the European Space Agency (ESA) launched into space the Herschel and Planck observatories, both of which use Lissajous orbits at Sun–Earth L2. ESA's current Gaia mission also uses a Lissajous orbit at Sun–Earth L2. 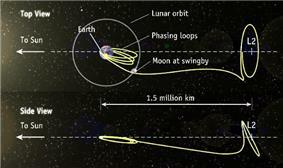 In 2011, NASA transferred two of its THEMIS spacecraft from Earth orbit to Lunar orbit by way of Earth-Moon L1 and L2 Lissajous orbits. China's lunar orbiter Chang'e 2 left lunar orbit on June 8, 2011 and flew to L2. In the science fiction novel Sunstorm by Arthur C. Clarke and Stephen Baxter, a huge shield is constructed in space to protect the Earth from a deadly solar storm. The shield is described to have been in a Lissajous orbit at L1. Similarly a group of wealthy and powerful people sheltered opposite the shield at L2 so as to be protected from the solar storm by the shield, Earth and Moon. ^ Koon, Wang Sang (2000). "International Conference on Differential Equations". Berlin: World Scientiﬁc. pp. 1167–1181. ^ "ESA Science & Technology: Orbit/Navigation". European Space Agency. 14 June 2009. Retrieved 2009-06-12. ^ Vallado, David A. (2007). Fundamentals of Astrodynamics and Applications (3 ed.). Space Technology Library (jointly with Microcosm Press). ^ "Solar and planetary destabilization of the Earth–Moon triangular Lagrangian points" by Jack Lissauer and John Chambers, Icarus, vol. 195, issue 1, May 2008, pp. 16-27. ^ Advanced Composition Explorer (ACE) Mission Overview, CalTech, retrieved 2014-09-06. ^ WMAP Trajectory and Orbit, NASA, retrieved 2014-09-06. ^ Genesis: Lissajous Orbit Insertion, NASA, retrieved 2014-09-06. ^ "Gaia's Lissajous Type Orbit". ESA. Retrieved 2006-05-15. Koon, W. S.; M. W. Lo; J. E. Marsden; S. D. Ross (2006). Dynamical Systems, the Three-Body Problem, and Space Mission Design.